Providing quality service since 1983, we are a rental provider of portable sanitary facilities and services for residential, commercial, and industrial customers in Baltimore and surrounding areas. We are large enough to satisfy the requirements of events with attendance as high as 15,000 persons, but small enough to be flexible and provide custom solutions to your personal needs, such as weddings, reunions, or corporate functions. 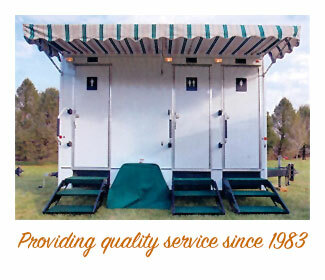 At Maryland Portable Restrooms our mission is to be a superior provider of portable sanitary facilities and services to all of our customers. We strive to do this with prompt service and attention to detail. Maryland Portable Restrooms is commited to delivering you a product that is of superior quality, cleanliness, and sanitization.